The crabs, which have been on earth for hundreds of millions of years and are older than dinosaurs, are harvested because their blood contains coagulogen, a chemical used to make sure medical products aren't contaminated by bacteria. The Atlantic States Marine Fisheries Commission, an interstate authority, voted this month to propose taking into account the death toll associated with medical harvesting when determining the number of horseshoe crabs that can be harvested from the Delaware Bay. The medical harvest of horseshoe crabs is about 500,000 crabs per year. The prehistoric-looking crabs typically are taken to labs, are drained of about a third of their blood and then are released alive into the same bodies of water where they were found, a spokeswoman for the commission said on Tuesday. It's unclear how many of the crabs die in the process, but the estimate is about 15 percent, said Kirby Rootes-Murdy, a fishery management plan coordinator with the fisheries commission. A firmer idea of how many die is important because of the crabs' place in ecosystems, such as their role as a food source for endangered birds, Rootes-Murdy said. "Whether biomedical is collecting too much, bleeding too much, that's really kind of an open question right now," he said. "There's uncertainty about whether it's really a significant impact or not." The crabs, which are shaped like helmets and have long tails, also are harvested by fishermen for use as bait in fisheries such as eels and whelks. Those activities are taken into account in fisheries managers' assessments of horseshoe crab populations, and they are subject to quotas and other regulations. The value of the commercial harvest of horseshoe crabs has grown from about $400,000 in 2004 to more than $1.8 million in 2014. The crabs have been around for more than 300 million years, the National Wildlife Federation says. They have been harvested from Maine to Florida, and one of the largest populations in the world is in the Delaware Bay area. The impact of biomedical harvesting of horseshoe crabs is concerning for fishermen in the bait industry, said Rachel Dean, who runs tours of fishing operations in Maryland and sits on the Atlantic States commission's horseshoe crab oversight board. "The statistics on whether or not it's impacted by the bleeding of the crabs would be important for our industry to know," Dean said. Some people in the medical industry defend the harvesting as critically important for products that benefit human health. 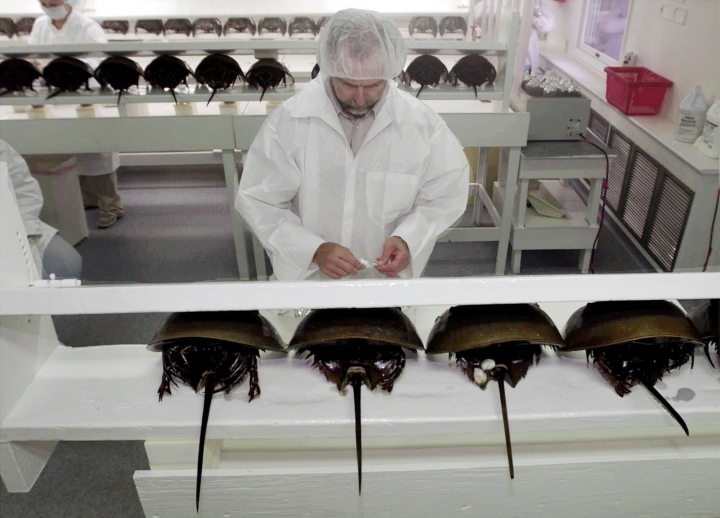 Benji Swan, who has worked in manufacturing of products that use horseshoe crab blood, said at the Atlantic States commission's meeting on Aug. 2 that she feels the industry is already transparent about the impact of harvesting. "Biomedical collection is separate from bait harvest and should be because it is essential to human health," she said. "Small mortality is unintentional and may be out of our control."